Silent Gliss 3840 Track Available in White, Gold, Bronze, Black and Silver. The silent gliss 3840 corded / hand drawn metal curtain track purpose designed for ceiling fixing and a very neat track. Suitable for medium weight curtains it is an excellent curtain track and as it looks the same on both sides. Available up to lengths of 6m in one piece but can also be supplied in two pieces with a joiner. This can be made to the exact size you require. The swivel bracket is suitable for ceiling mounting only. 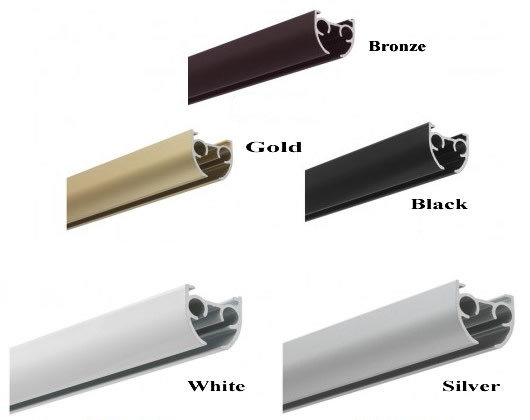 This product is also suitable for bay windows but must be custom bent for your bay. Silent gliss 3840 wave curtain heading systems are designed specifically for ceiling fixing using the discreet ceiling fix brackets, is suitable for medium weight curtains using standard gliders and heavy weight curtains using roller gliders. Ideal for domestic or contract work and available in lengths up to 6m in white, gold, bronze, black and silver.